AWESOME AGAIN is the most accomplished son of two-time Champion Sire Deputy Minister. The Classic winner and Breeders’ Cup Classic winner continues to sire the highest quality crop after crop. 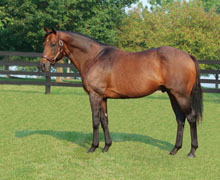 He sired nine stakes horses in the first nine weeks of 2008, and 46 stakes horses and earners of $31,000,000 from six crops to race Nearly two-thirds of his stakes winners are Graded winners, and one third are Grade I winners, including four individual Breeders’ Cup winners. 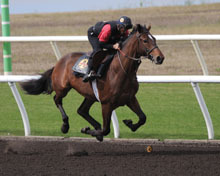 This Awesome Again colt is out of BROOK’S APPROVAL, who broke her maiden over 6 1/2 furlongs at two. His second dam is a half sister to five stakes horses, including a Kentucky Derby winner. Awesome Again has already crossed well with the immediate family, which includes his best son, Horse of the Year and Breeders’ Cup champion Ghostzapper. 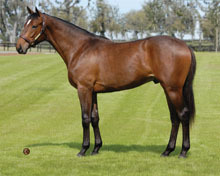 Deputy Minister crossed with a Buckpasser mare has already produced Classic winner and Classic sire Touch Gold.